Tsepiso Jomane was just a child when her sick grandmother tried & failed to get care at a rural, understaffed clinic. 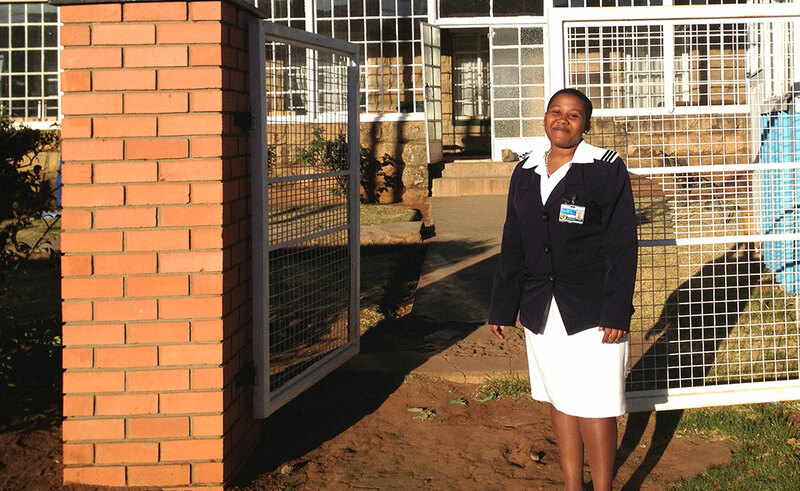 Today she’s a nurse in Lesotho, helping stem the shortages of quality health services in a rural community! Women and families in Lesotho seeking health care are frequently served by a nurse. Yet, before graduation, most of these health care providers had limited experience working in rural communities where 75 percent of the country’s 1.8 million people live. A project that paired nursing students with clinical tutors in rural community health clinics has produced graduates who are both skilled and confident in primary health care. The community placement project, supported by Jhpiego and conducted in 2012 by four faith-based nursing and midwifery schools, offered Lesotho and other countries a viable solution to a pressing human resource need to staff primary health clinics. A recent case study in a special issue of World Health & Population described the outcomes of the community placement project, which more closely reflected a student’s job assignment and responsibilities after graduation than placements in other settings. Like many nations in southern Africa, Lesotho has a severe shortage of health workers—there are less than six nurses per 10,000 people. With an even greater shortfall of physicians, nurses are the most likely health professional to offer primary care to people within a village. Although nurses are often deployed to serve remote communities after graduation, they receive little or no clinical education outside of a large, urban hospital setting. This is in stark contrast to studies that have shown a link between deployment and retention of health workers in hard-to-reach communities and efforts to educate those workers within those settings (Bennet et al. 2014; Couper et al. 2007). In partnership with the Ministry of Health, Jhpiego began working in Lesotho in 2011 under the United States Agency for International Development’s Maternal and Child Health Integrated Program. Jhpiego piloted the community placement project as part of the government’s efforts to strengthen nursing and midwifery education and provide students with experience in a rural health clinic. The pilot aimed to ensure that graduating students were competent and confident in primary health care skills and to increase recruitment and retention of nurses and midwives in rural areas. Because of the success of the pilot project, the four participating schools expanded their community placements. Between January and June 2013, a total of 192 students from the four schools were placed in 35 rural community health centers for a single rotation lasting two to four weeks. After their placements, students identified a significant improvement in their ability to diagnose and treat common primary health conditions, manage maternal and child health needs and the care of people living with HIV, provide a head-to-toe examination, and counsel and educate clients. Of those interviewed, more than half stated that they would like to work in a similar setting upon graduation—an added bonus in ensuring that quality health services reach Lesotho families in remote areas of this small, mountainous country. Placement of students in rural primary health care clinics demonstrates the realities of working in these settings and enhances students’ knowledge and skills. As a result of the success of this project, nursing and midwifery schools expanded the number of rural health care rotations and the Government of Lesotho committed to increase funding for the rotations so that more nurses and midwives will serve in rural areas.